Terrence Malick is pretty much the least prolific filmmaker in the world. He began his career with a film called Lanton Mills in 1969. He gained widespread critical support for his 1974 movie, Badlands. 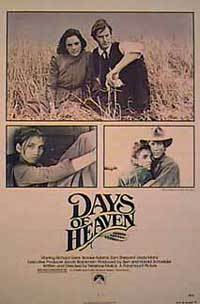 Then, in 1978, Days of Heaven. After that, nothing ... for 20 years. He then made The Thin Red Line, which came out while I was in high school and though I enjoyed it, I'm afraid I may have missed quite a bit of it. Next year he will be releasing The New World, for which the stunning trailer is already out. Days of Heaven is an absolutely beautiful movie, as well as being affecting and simple. It concerns three poor people from Chicago, a brother, his sister and his girlfriend, who are obliged to leave after the opening credits, which contain more sound than the rest of the movie combined. They board a train and end up somewhere in the middle of a red state with hundreds of other vagabonds. I won't go into detail about the story, if indeed it has details, but it is epic on a personal scale and well-written, by Malick himself. The most impressive thing about the film though is not the story, but the time and place. It is shot in such a way that I was absolutely convinced that this was a real pre-WWI wheat farm. There is no element which is out of place - the effect is a feeling of incredibe authenticity. The cinematographer, whom Malick always works with, won an oscar for his efforts here. A friend said that every shot could have been a painting, and it's true. The content, framing, colors, people, everything is aesthetically flawless. The other impressive part is the narration by the younger sister, a girl perhaps 12 years old but with a sort of detached wisdom I found kind of unnerving in the young actress. She narrates the story when that needs to happen, or just drops in with a non sequitur like "The mountains are gonna go up in big flames, the water's gonna rise in flames. There's gonna be creatures runnin' every which way, some of them burnt, half of their wings burnin." or "I'm been thinkin' what to do with my future. I could be a mud doctor, checkin' out the earth underneath." out of nowhere. It's strange and beautiful, and really quite short (95 minutes). Watch it with your honey bun. saw this two nights ago. great movie, the meditative pace reminds me of Tender Mercies and even like Five Easy Pieces - two of my favorite movies.